Baxter is unique. 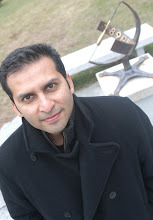 A playwright with a degree in zoology, he has been writing drama for 15 years. He has written ten plays, several adaptations, and a brace of radio dramas. But he has come into his own with his return to science in the past five years. His recent work includes The Altruists, about 20th-century evolutionary biologists, and Re:Design, a daring play based on Darwin's letters, composed entirely from Darwin's words and the words of his correspondents [reviewed in (2)]. Bringing Darwin to the stage was all very well. That was the 19th century, Darwi n was liked and prolific, and there were thousands of genial and engaging letters from which Baxter could cut his material. Newton, however, is another country. He was troublesome. He was guarded, secretive, and paranoid. There is no consensus about his personality from his biographers. There are gaps in the historical record. There were few letters for Baxter to work with. But there were words. Millions of them, from notebooks and personal accounts. The incomparable Newton Project, which over the past ten years has put four million of Newton's words online (making them widely accessible for the first time), has revolutionized the ways in which we can understand Newton. And Baxter has quarried these millions of words on theology, alchemy, mathematics, and physics to produce a Newton whom brilliantly he chose to split. Baxter gives us a trinity of Newtons: the child Isack (played by Caroline Rippin), who runs and jumps and measures and records; the man Newton (played by Neil Jones), at war with himself, contemplative, constantly list-writing, driven, and on the brink of breakdown; and the mature Sir Isaac (played by Paul McCleary), self-possessed master of the mint. It would have been easy to present Newton's life chronologically, one Newton after the other. But Baxter has all three on stage all the time, challenging and questioning one another. That produces a multidimensional Newton—one who is indeed torn among selves, split, divided, energetic, and spilling over, but whom we see as a complete being. The result is a play that barely contains its own subject. This is the theater of ideas at its very finest. It is mesmerizing, inventive, and provocative. Director Patrick Morris brilliantly choreographed the actors to orbit one another, constantly recomposing the geometry of a disordered mind. The young Newton keeps returning to his desk and to his accounts book, recording and repeating lists—of accounts of sins, of daily routines. This was a Newton who did not know how to stop and who was always preoccupied with theology, with defining a God and defining for God. Somewhere around the middle of the play, the anguished energy spills over into nightmare, and Newton breaks down. He is held down by his servants, only to get up moments later and start all over again. This is intelligent and psychologically perceptive direction, and the result is moving. 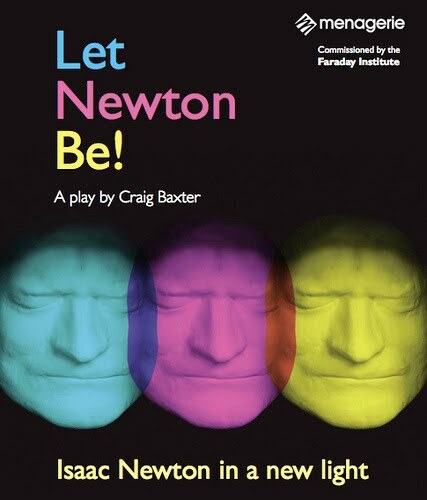 Newton's extraordinary mind is embodied not only in the text and the trinity of selves but also in the wonderfully effective and visually exciting set designed by Issam Kourbaj, artist in residence at Christ's College. The set transforms endlessly using Newton-like contraptions that open out into chairs, then to desks, then bookcases, then into models of windmills. Flecked with red velvet and the scribblings of the Lucasian professor's handwriting, the set folds and unfolds in and out of itself: windows within windows, wheels within wheels. If Newton's mind could be represented visually, this would be it. Very cool! I really hope it shows up at Boston or New York.